You're no average Joe, and your jewelry should match. 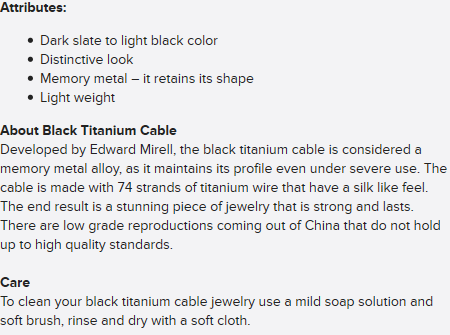 The distinctive Edward Mirell Black Titanium Cable Bracelet is the perfect pick for the contemporary jewelry-lover who appreciates Mirell's artful yet industrial approach. 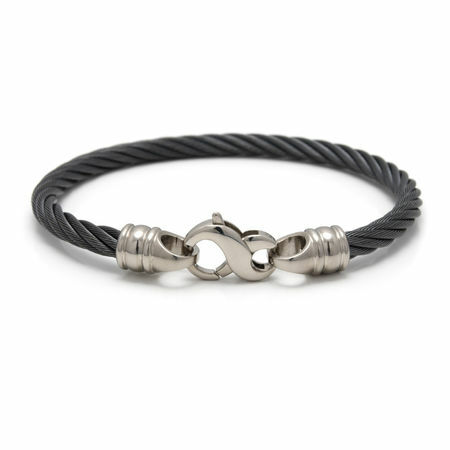 This unisex 4mm bracelet is constructed from memory cable that retains its shape and features an oversized black gray titanium clasp for a bold finish. The Black Titanium Cable Bracelet is made with dark slate to light back titanium cable that's lightweight and comfortable for all-day wear. It's available in three lengths - 7.5 inches, 8 inches and 8.5 inches - for a perfect fit. Edward Mirell jewelry includes free, insured shipping from Titanium Jewelry. Length: 7.5", 8" OR 8.5"
I bought this for myself about 12 months ago. I wear titanium glasses and watch because I am allergic to nickel. The bracelet looks jsut as good now as it did when I opened the box and I NEVER take it off. It is incredibly light and comfortable. Craftsmanship is superb & quality is HIGH. The bracelet rocks! Lightweight, smart looking, great customer service, quick deliver! The best! the only draw back is that it did not come with a certificate of authentication. My only suggestions would be to find a way to make its size at least partially adjustable. I would love to have it just a bit shorter but the smaller size would have been too small. This bracelet is awesome and my husband loved it. I bought it as an anniversary gift. He was very impressed. It's a everyday piece. Very well made and comfortable to wear. The only thing about it that I was slightly dissappointed about was that it wasn't black. It's charcoal grey. It's still a great piece and I think now I actually like the dark grey on him better than I would have if it was truly black. Have had several positive comments and questions about the bracelet. I highly recommend T.J. and the website every chance I get. The color was not really black. It appears more of a dark grey, but I still love it. Have seen black bracelet with gold clasp in the islands. Would like to see one offered on line without the stone.